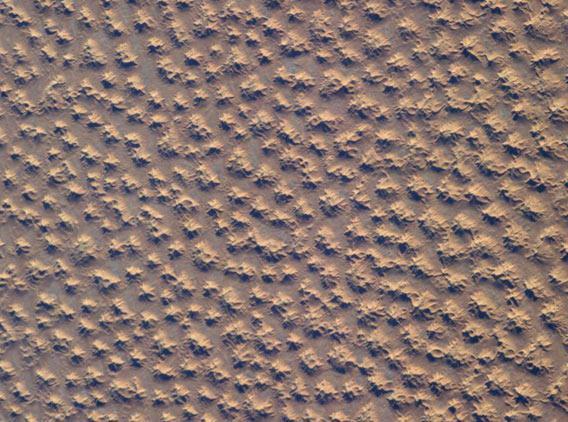 Optical illusion: Picture of sand dunes from space look like pits. 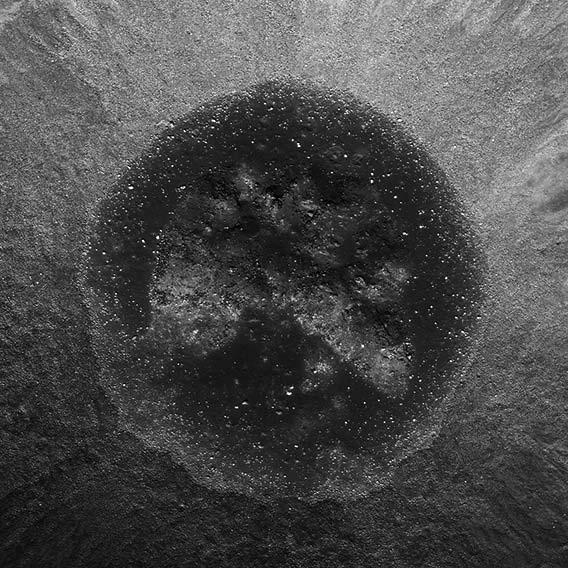 An impact crater on the Moon. A few days ago, I posted a picture of a crater on the Moon that illustrated one of my favorite illusions. In it, boulders and hills look like depressions, pits in the surface. This illusion comes about because when we look at a picture of an object, our brains expect it to be lit from above, from the top of the frame. This is a holdover from millions of years of evolution, and the fact that the illuminating Sun is above our heads when we walk around. Our brains automatically assume light comes from above. So when we see a picture lit from below, our brains freak out. They still try to interpret the shot like the light is coming from the top, but the shadows are all wrong. So the image becomes inverted, and hills look like depressions, and pits look like hills. Sand dunes in Africa seen from space. Click to enaeolianate. When I saw that, I laughed out loud! Those dunes* really look like gigantic pits in the ground, like imperfections in a piece of clay or rock. Look at it carefully: See how the shadow of each feature is to the upper right, and the lit part of the ground to the lower left? If the Sun is coming from above, from about the 1:00 position in the photo, that makes sense only if the features are pits in the ground. The same image, rotated 180°. Aha! Now they look like dunes, don’t they? Mind you, I rotated the image, so now the sunlight really is coming from the 1:00 position, and your brain is happy. This is a fantastic example of how easy it is to fool our brains. I’m fascinated by optical illusions, not just because they are intrinsically fun, but also because of the lesson in them. We see things and swear that what we see is what’s really going on. But in many cases—I’d argue most cases—that’s not true. Lighting, color, motion, perspective, expectations…these all distort what we see, changing them as the light travels from them, through our eyes, and into our brains. What we see is most decidedly not what we get. Bear that in mind the next time someone says, “I know what I saw.” Because there’s a good chance they really don’t. 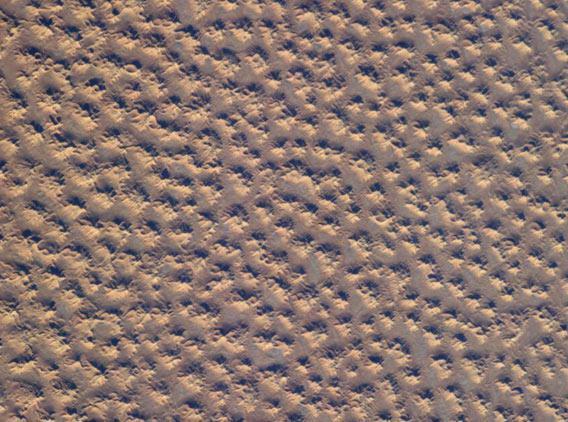 *The dunes are located near the Algeria/Libya border; Mike Allyn was able to find the time the picture was taken, and I used that info to get the location of the International Space Station at that time.